20-Aug-2006 -- I decided to make a visit here on a beautiful mid-August Sunday afternoon. I left my home in Osceola and made the drive to Danbury via highway 35 for a quick bite to eat and to review my exact route to the confluence. After that I struck out east on highway 77 and headed south on Lower McKenzie Lake Road. 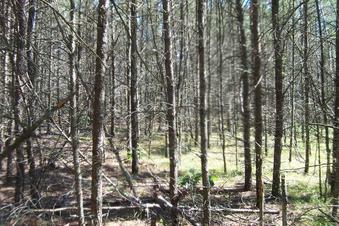 I then turned east on Zehm road, leading further into Washburn County Forest land. I wasn’t paying attention and I initially made a wrong turn and ended up at Lower McKenzie Lake a mile or two further south, but then I backtracked to the previous intersection and continued east down a seemingly abandoned stretch of unpaved forest road. It’s labeled “Dolly Road” on Mapquest, but is no longer marked at all in reality except by a naked metal signpost and a stop sign (as if there’s ever any traffic). Actually, Dolly Road wasn’t really anything more than an undulating and deeply-rutted, sandy double track, complete with a couple of downed trees partially blocking it, that I wouldn’t want to tackle in any two-wheel-drive passenger car. Luckily my Jeep took me a little over half a mile to an intersection with a dirt lane heading north and another heading a few yards northwest before fizzling out in the woods. I parked there and hiked into the forest, GPS in hand. After a few minutes I found the confluence, but it took awhile to get a perfect reading. Eventually my patience paid off with my first confluence visit.